Tuesday September 25th 1900 It was very warm for the time of year The ice is all gone and I had a lot of extra work in the milk house. I fixed my hat in the afternoon. 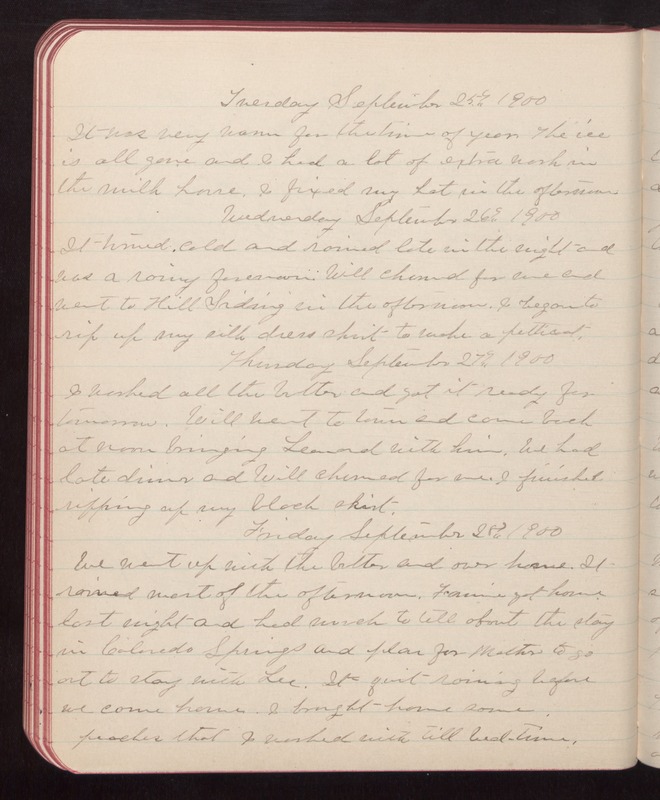 Wednesday September 26th 1900 It turned cold and rained late in the night and was a rainy forenoon. Will churned for me and went to Hill Siding in the afternoon. I began to rip up my silk dress skirt to make a petticoat. Thursday September 27th 1900 I worked all the butter and got it ready for tomorrow. Will went to town and came back at noon bringing Leonard with him. We had late dinner and Will churned for me. I finished ripping up my black skirt. Friday September 28th 1900 We went up with the butter and over home. It rained most of the afternoon. Fannie got home last night and had much to tell about the stay in Colorado Springs and plan for Mother to go out to stay with Lee. It quit raining before we came home. I brought home some peaches that I worked with till bed-time.